Image caption Did this moonscape offer JRR Tolkien inspiration for the world of Middle Earth? 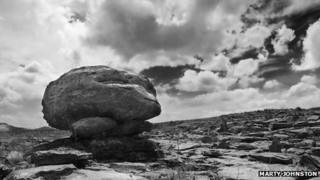 Was the wild lunar landscape of the Irish Burren in County Clare an inspiration for Tolkien's Middle Earth? That is the question up for debate at the first Irish symposium for Lord of the Rings lovers to be held in May. Fans of Bilbo Baggins, Gollum and other JRR Tolkien creations are invited to discuss how the limestone rocks of the Burren are reflected in his famous chronicles. 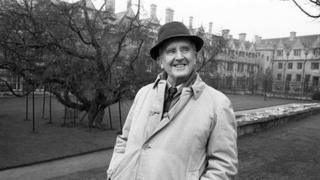 JRR Tolkien was a close friend of CS Lewis, author of the Narnia chronicles, who was from Belfast in Northern Ireland. He visited the Irish west coast with his friend. Tolkien also spent time as an external examiner with the English department at the National University of Ireland (NUI) Galway. It is said that one of Tolkien's best known characters, Gollum, may be named after Poll na gColm (pronounced Pole na Gollum - cave of the rock dove) in the Burren. Gortnaclare Mountains in the region have also been compared to the misty mountains of Middle Earth. Peter Curtin from Lisdoonvarna in County Clare first stumbled upon the link when he was living in Galway in the mid 1970s. A chance conversation with the housekeeper for a Dr Martyn - an expert on the Burren - brought up the possible link. Fast forward to 2008 and he traced a Rose MacNamara whose family were friends of Tolkien. "Tolkien is remembered by Rose as a gentle man who loved nature, and who, when he felt tired while out walking, would just lie down and have a nap," he said. "Rose confirmed that her parents took Tolkien to the Burren (and to Dr Martyn's residence) and Connemara on numerous occasions." Tolkien's links with NUI Galway are also charted on the Burren Tolkien Society website. Barry Houlihan, an archivist at the university, said they date back to the mid 1950s when Tolkien set exam papers in English Literature for the Galway students. "He came over here in 1949, 1950, 1954 and 1959. So spanning that 10-year period, he was a regular visitor to Galway and the west of Ireland," Mr Houlihan said. "His legacy is that, as a fantastic writer and as a master of middle English, he was also a master of landscapes. He used to travel extensively through the Burren as an expert in botany and in landscapes. We all know the landscapes that Tolkien created through his writings. Image caption Did Gollum get his name from Poll na gColm in the Irish Burren? "The landscapes of the Burren and the west of Ireland perhaps inspired the landscapes of the Lord of the Rings." Mr Houlihan said exam papers set by Tolkien between 1949 and 1959 are stored in the university's archives. "They were quite challenging papers at the time. Our students who found this out late last year said that, as stressful as times with exams are, at least they weren't handing their work up for correction to the Master of Middle Earth." Travel writer Paul Clements, who has written about the Burren, said: "The connection with Poll na gColm is a strong one when you think of the name, Gollum. "The extent of the link will come out at the symposium. 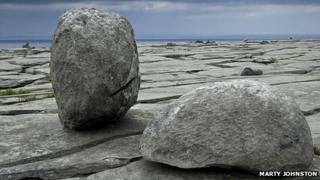 "But the Burren is the sort of place that Tolkien would have loved. You can imagine him looking over that limestone pavement and letting his imagination wander. It is an inspiring place for so many writers." The conference organisers stress that while the connection with JRR Tolkien is somewhat controversial, relatively unproven and remains a source of discussion, the festival itself seeks to celebrate both the incredible fantasy world Tolkien created and the literature, poetry and history of the Burren. 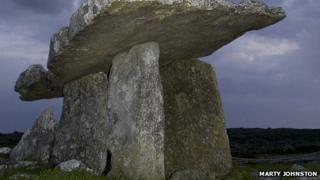 The inaugural Tolkien Burren Festival takes place in the Burren region from 9 to 16 May 2013.